Relax and connect with the people who matter most to you. This water care system automatically makes strong cleansing agents that keep spa water sparkling. Our exclusive cover lifters allow you to easily access your spa pool – so you can use it more frequently plus it keeps your spa pool cover off the floor helping it last longer. 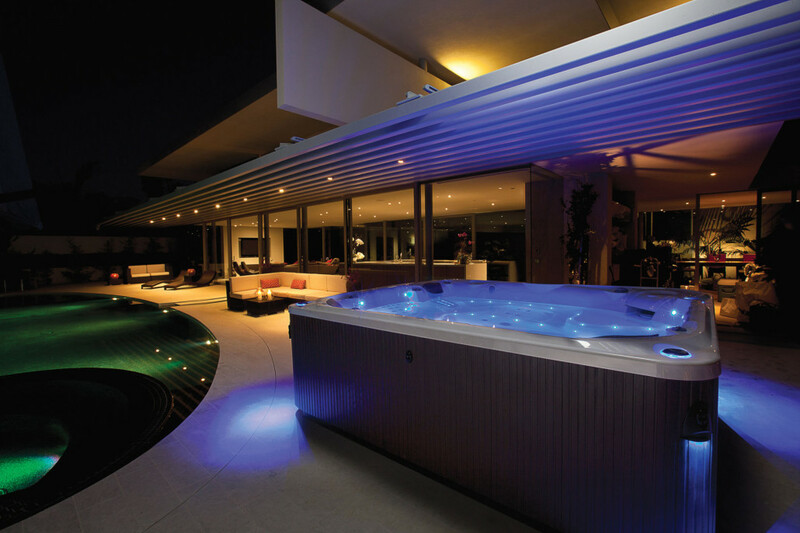 Making it simple to climb in and out your spa pool, HotSpring® Spa Pools side stairs are created to match your spa pool cabinet. Designed to comfortably seat up to 8 people, the Gleam model creates a soothing space to relax and connect with friends and family. 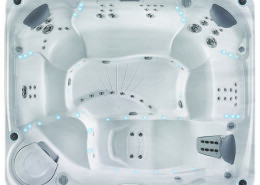 In addition to modern styling and state-of-the-art jets that deliver soothing massage, the Gleam creates soothing ambiance with multi-color exterior lighting and a Vidro® lit water feature. The Limelight® Collection delivers quality and performance with breathtaking, contemporary style. 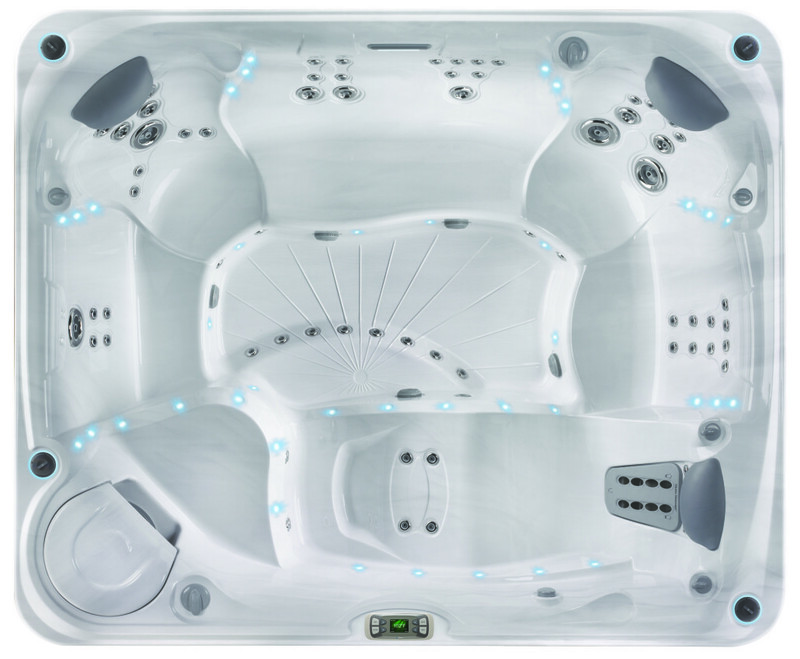 Designed with sophisticated sculpting throughout the shell, stunning points of multi-colour lighting, and powerful jets for invigorating massage, you can sit back and relax knowing you have chosen the best – a Hot Spring® spa. With clean lines and flowing curves, the acrylic shell is beautiful in appearance, and built using a two-stage process for strength and durability. 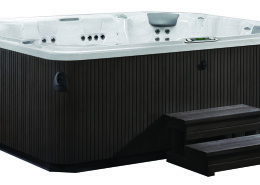 Eye-catching details include the stylised bartop, custom jet recesses, and vibrant stainless steel jet trim. 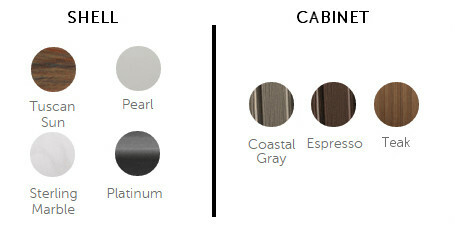 The exclusive Everwood™ cabinet delivers low maintenance and high durability, and comes with a five-year warranty. The embossed wood-grain look provides the natural warmth and beauty of wood. Every Limelight Collection cover is UL classified in accordance with ASTM safety standards. Your cover includes child resistant safety locks that can be locked with a key and reinforced, adjustable straps that help keep your cover securely in place.